Hill has won five Grammy Awards, 15 Academy of Country Music Awards, six American Music Awards, and several other awards. Her Soul2Soul II Tour 2006 with McGraw became the highest-grossing country tour of all time. In 2001, she was named one of the "30 Most Powerful Women in America" by Ladies Home Journal. In 2009, Billboard named her as the No. 1 Adult Contemporary artist of the 2000s decade and also as the 39th best artist. From 2007 to 2012, Hill was the voice of NBC Sunday Night Football's intro song. In 2019, Hill will receive a star on the Hollywood Walk of Fame. Hill was born in Ridgeland, Mississippi, north of Jackson, Mississippi. She was adopted as an infant, and named Audrey Faith Perry. She was raised in the nearby town of Star, 20 miles outside of Jackson. Her adoptive parents, Edna and Ted Perry, raised her with their two biological sons in a devout Christian environment. Hill's vocal talent was apparent early, and she had her first public performance, at a 4-H luncheon, when she was seven. In 1976, a few days before her 9th birthday, she attended a concert by Elvis Presley at the State Fair Coliseum, in Jackson, which impressed her deeply. By the time she was a teenager, Hill was a regular performer at area churches, even those not in her own Baptist denomination. At 17, Hill formed a band that played in local rodeos. She graduated from McLaurin Attendance Center in 1986, and briefly attended college at Hinds Junior College (now Hinds Community College) in Raymond, Mississippi. At times, she sang for prisoners at the Hinds County Jail, her song of choice being "Amazing Grace". At age 19 she quit school to move to Nashville and pursue her dream of being a country singer. In her early days in Nashville, Hill auditioned to be a backup singer for Reba McEntire, but failed to secure the job. After a stint selling T-shirts, Hill became a secretary at a music publishing firm. Hill also landed a job at a local McDonald's restaurant franchise, which she disliked intensely. "Fries, burgers, cash register – I did it all, I hated it," she has said. A co-worker heard Hill singing to herself one day, and soon the head of her music publishing company was encouraging her to become a demo singer for the firm. She supplemented this work by singing backup vocals for songwriter Gary Burr, who often performed his new songs at Nashville's Bluebird Cafe. During one of those performances, Martha Sharp, an executive from Warner Bros. Records was in the audience, and, impressed with Hill's voice, began the process of signing her to a recording contract. Hill's debut album was Take Me as I Am (1993); sales were strong, buoyed by the chart success of "Wild One". Hill became the first female country singer in 30 years to hold Billboard's number one position for four consecutive weeks when "Wild One" managed the feat in 1994. Her version of "Piece of My Heart", also went to the top of the country charts in 1994. The album sold a total of 3 million copies. Other singles from the album include "Take Me as I Am". The recording of Faith's second album was delayed by surgery to repair a ruptured blood vessel on her vocal cords. It Matters to Me finally appeared in 1995 and was another success, with the title track becoming her third number-one country single. Several other top 10 singles followed, and more than 3 million copies of the album were sold. The fifth single from the album, "I Can't Do That Anymore", was written by Alan Jackson. Other singles from the album include "You Can't Lose Me", "Someone Else's Dream", and "Let's Go to Vegas". During this period, Hill appeared on the acclaimed PBS music program Austin City Limits. Musically, in 2000, Hill recorded a song for the movie Dr. Seuss' How the Grinch Stole Christmas, entitled "Where Are You Christmas" (written by James Horner, Will Jennings and R&B artist Mariah Carey). The song also appeared on the pop and country charts. Hill's success on the pop charts disturbed some country music insiders, who questioned whether she was trying to dismiss her country roots and move into the pop genre. Despite the grumbling, Hill won the CMA Female Vocalist of the Year Award, and in her acceptance speech announced, "I love this business, and I love this industry... and my heart is here." Hill was one of 30 artists selected to perform on "Forever Country", a mash-up track of the songs "Take Me Home, Country Roads", "On the Road Again" and "I Will Always Love You". The single was released September 16 and celebrates 50 years of the CMA Awards. Episode: "The Road Home (Part 1)"
1997 Promised Land Episode: "The Road Home (Part 2)"
2000 Super Bowl XXXIV "National Anthem"
2002 Saturday Night Live Herself (musical guest) Episode: "Sarah Michelle Gellar/Faith Hill"
2005 E! True Hollywood Story Herself Episode: "Country Divas"
2009 Super Bowl XLIII "America the Beautiful"
2010 Project Runway Herself (guest judge) Episode: "Finale (Part 2)"
2011 CMT Crossroads Herself (performer) Episode: "The Pretenders/Faith Hill"
Top Single of the Year – "This Kiss"
Top Music Video of the Year – "This Kiss"
Video of the Year – "This Kiss"
Single of the Year – "This Kiss"
2003 CMT Music Awards Hottest Female Video of the Year – "When The Lights Go Down"
^ Whitaker, Sterling (December 23, 2015). "Faith Hill Honored by Mississippi Home Town". Taste of Country. Retrieved January 1, 2016. ^ "About Faith Hill". Country Music Television. Viacom. Retrieved February 13, 2014. ^ a b "Tim, Faith set tour mark". Country Standard Time. September 14, 2006. Retrieved February 13, 2014. ^ "Artists of the Decade: No. 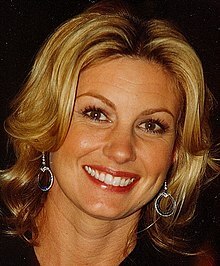 39 – Faith Hill". Billboard.com. Retrieved December 25, 2012. ^ Madden, Lance (April 15, 2013). "Faith Hill Is Leaving NBC, Sunday Night Football". Forbes. Retrieved February 13, 2014. ^ Hermanson, Wendy. "Powerful Country Women Getting Stars on Hollywood Walk of Fame". Taste of Country. ^ Malone, Bill C. (2002). Country Music, U.S.A.: Second Revised Edition. University of Texas Press. ISBN 9780292752627. ^ "Faith Hill Biography". People. Time Inc. Retrieved February 15, 2014. ^ a b c d e "Interview with Faith Hill and Tim McGraw". Larry King Live. CNN. April 21, 2006. Retrieved February 13, 2014. ^ a b c d e f g h i j Huey, Steve. "Faith Hill". Allmusic. Retrieved April 23, 2007. ^ "Faith Hill on music, junk food and poetry". Self. August 21, 2006. Archived from the original on September 29, 2007. Retrieved February 13, 2014. ^ Helligar, Jeremy; Green, Mary (July 12, 1999). "Faith Accompli". People. 52 (1). Retrieved July 17, 2014. ^ a b Dukes, Billy (September 21, 2011). "10 Things You Didn't Know About Faith Hill". Taste of Country. Retrieved February 13, 2014. ^ Haislop, Neil (May 2, 2007). "Country Q&A: Week of May 2, 2007". Great American Country. Scripps Networks. LLC. Archived from the original on January 3, 2013. Retrieved February 13, 2014. ^ Faith Hill. Infobase Learning. November 15, 2012. p. 18. ISBN 978-1-4381-4095-7. Retrieved February 15, 2014. ^ "Faith Hill Biography". The Biography Channel. A+E Television Networks, LLC. Retrieved February 13, 2014. ^ Neal, Kathleen (2001). "A leap of Faith". Atlanta Social Season. Archived from the original on July 27, 2015. Retrieved February 13, 2014. ^ Kingsbury, Paul (November 5, 1998). The Encyclopedia of Country Music: The Ultimate Guide to the Music. Oxford University Press. p. 240. ISBN 978-0-19-984044-1. Retrieved February 15, 2014. ^ a b c Wix, Kimmy (April 29, 1998). "Faith Hill". Country Music Television. Retrieved April 23, 2007. ^ a b c d e Orr, Jay (November 22, 2000). "Faith Prevails". Country Music Television. Retrieved February 13, 2014. ^ a b Dinoia, Maria Konicki. "Album Review". Allmusic. Archived from the original on September 22, 2007. Retrieved April 23, 2007. ^ a b "Grammy Award Winners". Grammy Award. Archived from the original on September 21, 2007. Retrieved April 23, 2007. ^ Willman, Chris (December 10, 1999). "Faith Hill: The New Hitmaker". Entertainment Weekly. Retrieved February 13, 2014. ^ "Hill Makes Another List". Country Music Television. January 11, 2001. Retrieved April 23, 2007. ^ Silberman, Jeff. "Tracking the Downloading Revolution" (PDF). Big Champagne. Archived from the original (PDF) on July 4, 2007. Retrieved April 23, 2007. ^ "Faith Hill's New Album Debuts at No. 1". Country Music Television. August 10, 2005. Retrieved February 13, 2014. ^ Cook, Katie (August 1, 2005). "Faith Hill Releases Fireflies". Country Music Television. Retrieved February 13, 2014. ^ Dawson, Dave (September 21, 2005). "Faith – Top of the Hill". Nu Country. Retrieved April 23, 2007. ^ Barker, Andrew (August 28, 2006). "Tim McGraw & Faith Hill". Variety. Retrieved February 13, 2014. ^ Lowe, Jack. "Faith Hill – The Hits". about.com. Retrieved June 18, 2009. ^ "Faith Hill to sing 'Sunday Night Football' theme". NBC Sports. Associated Press. August 30, 2007. Archived from the original on March 13, 2008. Retrieved February 13, 2014. ^ Webb, Jennifer. "Faith Hill Joy to the World review". about.com. Retrieved June 18, 2009. ^ Gibson, Tammy. "Faith Hill Performs at Super Bowl XLIII Pregame Show". a mom in red high heels.com. Retrieved June 18, 2009. ^ "Producer Brendan O'Brien Not Working With Madonna". Spinner.com. January 13, 2010. Retrieved October 22, 2011. ^ Graff, Gary (February 12, 2011). "Faith Hill returning to studio in March". Reuters. Retrieved February 13, 2014. ^ Dukes, Billy. "Faith Hill Debuts New Song 'Illusion' During 'CMA Music Festival' Television Special". Taste of Country. Retrieved September 22, 2012. ^ "Faith Hill to Release Final Album on Warner Bros. Records". Sounds Like Nashville. November 12, 2016. Retrieved March 20, 2017. ^ "Tim McGraw and Faith Hill Sign Record Deals with Sony Music Entertainment". Sounds Like Nashville. February 13, 2017. Retrieved March 20, 2017. ^ "Tim McGraw and Faith Hill Announce Joint Single, Album". Sounds Like Nashville. March 20, 2017. Retrieved March 20, 2017. ^ Susman, Gary (April 15, 2003). "Act of Faith". Entertainment Weekly. Retrieved April 23, 2007. ^ Travers, Peter (June 10, 2004). "The Stepford Wives: Review". Rolling Stone. Retrieved January 13, 2009. ^ Schwarzbaum, Lisa (June 9, 2004). "Movie Review: The Stepford Wives". Entertainment Weekly. Retrieved January 13, 2009. ^ Scott, A.O. (June 2004). "The New York Times Review: The Stepford Wives". The New York Times. Retrieved January 13, 2009. ^ Yamato, Jen (November 5, 2014). "Faith Hill Back To Movies As Country Star Joins Crime Drama 'Dixieland'". Deadline.com. Retrieved November 25, 2015. ^ "Dixieland". Tribeca Film Festival. Archived from the original on November 26, 2015. Retrieved November 25, 2015. ^ Perez, Rodrigo (November 25, 2015). "Watch: First Trailer For Tribeca Drama 'Dixieland' Starring Riley Keough, Chris Zylka & Faith Hill". Indiewire.com. Archived from the original on November 26, 2015. Retrieved November 25, 2015. ^ "Hill Performs By the Book". Country Music Television. March 26, 1999. Retrieved April 23, 2007. ^ "A Bit of "Faith" Brought in a Lot of Books". Country Music Television. August 20, 1999. Retrieved April 23, 2007. ^ Gordon, Dan; Wolf, Buck (March 8, 2006). "Faith Hill, Tim McGraw Blast 'Humiliating' Katrina Cleanup". ABC News. Retrieved March 15, 2007. ^ "Country, Rock Stars Join For 'Nashville Rising' Benefit". Billboard.com. September 14, 2009. Retrieved October 22, 2011. ^ "Samuel S. Beard Award : Greatest Public Service by an Individual 35 Years or Under". Jeffersonawards.org. Retrieved September 1, 2014. Wikimedia Commons has media related to Faith Hill.